Amazon Echo Spot review | What Hi-Fi? In 2016, Amazon announced the Echo Dot – a small, puck-like speaker with a voice assistant built in that could play music, answer simple questions, or do a range of other things through applications. Compared to the original Amazon Echo, its appeal was clear: it was a smaller, cheaper, more attractive way of getting Amazon’s voice assistant Alexa into your home. 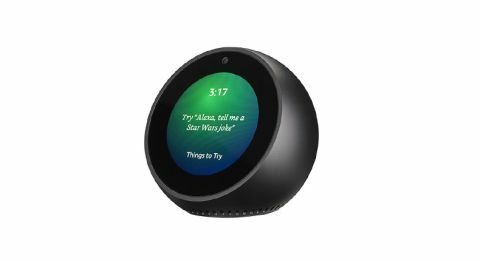 In 2018, Amazon is trying the same tactic with the Echo Spot – a small, round speaker, that looks like a clock, with the same built-in voice assistant and functionality. This one, however, comes with a screen (for information ‘at a glance’, according to Amazon) and a camera for video-chatting. As the Dot was to the original Echo, the Spot is to the Echo Show – a product that Amazon launched in the UK last November. The Spot has a smaller screen and speaker, but those are the only real design differences. With the same smart-assistant capabilies as the other Echo products, Amazon is hoping for the Spot to be seen as another entry-point into their smart-device ecosystem. But how much more does this smart-clock offer over its bretheren – especially with a larger price tag, and a potentially more intrusive presence in your home? Rather than the cylindrical body of the Amazon’s speaker products, or the angular design of the Echo Show, the Echo Spot is round with a flat bottom, and is about the size of a coffee mug. It feels well made, and at 420g, it has a good weight to it. It’s hefty enough to seem sturdy, yet light enough to place anywhere. On its face is a round, 6.3cm LCD touchscreen with a resolution of 480 x 480 pixels, while on the bottom is a built-in 2W, 35mm speaker – although the Spot also has a 3.5mm jack and Bluetooth to connect to better-sounding kit. Bluetooth connectivity also works if you wish to use the Spot as a speaker, connecting to your smartphones and tablets. At the top of the Spot are three buttons, two for volume and one to toggle the microphone on and off. The camera, which is placed unobtrusively in the middle of the outer ring, has a similar toggle, but that’s located deeper into the Spot’s settings. Right now, the camera’s primary function is video calling, similar to Apple’s FaceTime or Microsoft’s Skype – which you can do with anyone that has an Echo Spot or Echo Show. For those with an Alexa-enabled speaker, you can make voice calls to them using the Spot’s four-microphone array, which we found as responsive in our medium-sized testing rooms as the other Echo devices were. Voice and video calling comes in two forms: a normal video call where the other person has to answer, and a ‘Drop In’ mode that has the device automatically engage the call. This can be disabled from the settings for privacy reasons, but might be a boon for those thinking of using the Spot to easily video-chat with parents or grandparents. However, the camera is definitely the Spot’s most controversial feature. While some people like what it brings to the table, others may have concerns about introducing an internet-connected camera into their home. While Amazon would no doubt argue that its hardware is secure, it’s only a few months since it was revealed that Google’s Home Mini devices shipped with a software fault that meant they were almost constantly recording. If the thought of having the camera is disconcerting, you might want to consider disabling it or placing some tape over it when not in use. As expected, the Echo Spot has all the abilities of other Echo devices: you can use it to call you a taxi, check your flights, order pizza, ask it to solve sums, and do the range of other functions allowed by Amazon’s voice assistant. In order to start using the Echo Spot, you have to sign in to your Amazon account and connect to the local wifi using the on-screen keyboard. This is straightforward enough, but it would be easier to set up through the Alexa app for iOS and Android as a smartphone keyboard is easier to type on. By default, the Spot goes to an analogue clock face, but there are a number of other design options and digital layouts too so that it matches your interior design – including Onyx, Bold Teal, Modern Fuschia, one that looks like an owl, and one that looks like a vinyl record (our obvious preference). It then scrolls continually through a range of information, including notifications from your Alexa skills, upcoming events (if you’ve linked your calendar to the Alexa app) and headlines from trending stories from a number of news outlets. The stories that are shown are curated by workers at Amazon itself, rather than based on an algorithm. Some may appreciate the human touch, but we would like a more personalised approach, especially in a product you could be using regularly in spaces definitively yours. These are separate from the News Briefing (which reads you a daily news update). This has been optimised for the Spot with accompanying video. BBC News, for example, will show you its briefing in video form – either letterboxed to a 16:9 display with black bars on the top and bottom, or in a full-frame mode that crops the video. If you’re signed up to Amazon Prime, you can also watch Prime videos on the Spot with phrases like “Alexa, play Preacher”. Amazon is pitching the Spot as a product you could keep not just in the bedroom but also the kitchen too, and it’s easy to see how useful the screen might be for watching recipe videos from YouTube, for example. However, due to Amazon and Google’s ongoing feud (which saw YouTube removed from the Fire Stick and the Echo Show) the internet’s main source of video content is unavailable on the Echo Spot. Moreover, some of Amazon’s skills are yet to use the Spot to its full potential. The one Alexa recommended for cooking displays step-by-step instructions on screen while reading them out simultaneously. However, rather than having the instructions scroll in-time with the recording, the text remains still while Alexa continues to talk. In order to see the rest of the steps on screen, you have to manually scroll them yourself. And if you’re midway through baking, for example, we imagine you’d be loathe to smear the touchscreen with dirty fingers. That said, the ability to check multiple timers at a glance on the Spot – instead of having to ask Alexa to check them as you do on other Echo devices – is much easier than without, and the screen does have a distinct advantage when it comes to playing music. Some songs have rolling lyrics, displayed over the album artwork, and using the touchscreen to scroll vertically back and forth through them to control playback is particularly satisfying. Those worried about their children seeing foul language will be pleased to know that Amazon has censored some of the more explicit words. While the screen’s 250 nit brightness is potent enough for displaying text and clock faces, we couldn’t recommend using it as a proper video source. Arguably, that’s not as important on this device as it would be on others – the Echo Spot will be judged more on what it can do, rather than how well it does it. To its credit, the Echo Spot has a relatively balanced tonal palette when it comes to its Prime Video selection. Watching Lucifer through Amazon Prime Video, skin tones look good and even under the deep, saturated lights of the Los Angeles nightclubs the Spot doesn’t overblow the reds and oranges. The Spot certainly favours bright lights; sunny beaches and clear blue oceans are conveyed well. But change to something murkier, like Mr Robot, and it’s difficult to distinguish between a dark coat and the shadowy backgrounds. It also, somewhat expectedly, has a tough time showing off any real detail. The low-resolution screen makes it difficult to get any insight to the texture on a character’s outfit or their hair. Similarly, sound performance, while a marked improvement on the Echo Dot, lacks overall detail and dynamic quality, compared to dedicated smart-speakers like the new Amazon Echo. Playing Kanye West’s Power through the Spot’s built-in Spotify connection, the midrange is commendably clear. It’s detailed enough to make out the little breaths West takes before going into a line, and the plosive character of each lyric as he spits them out. Since the majority of the sound you’ll be listening to from the Spot will be from Alexa, or news sources, this is certainly the most important factor. Even tracks that push the treble, like Max Roach’s Lonesome Lover, come across relatively well – although turn the volume up and it does tend to get a little harsher. The bass is the area that most obviously lets the Spot down. While the Echo 2 can provide a comparably multi-layered sound in low-frequency guitars, hinting at the texture to deeper drums, the Spot doesn’t present a particularly insightful, or punchy, sound when given something with a deep beat. Products like the Echo Spot live and die by their features. This is the first of its kind to come through the What Hi-Fi? testing rooms and it has performed well. It has a number of useful features, the display is sharp and it looks rather elegant. However, it’s a much greater investment than the Echo Dot or even the regular Echo, and should a competitor arrive with a greater array of features, the Spot may not hold its value as well as a smart-speaker. The current fragility of the deals behind those services means that if YouTube was to be added, for example, the Spot would be a five-star product. On the other hand, should Spotify decide to end its partnership, it could be three-stars. Nevertheless, the Echo Spot is an impressive piece of kit, and an almost-perfect bedroom clock. It’s certainly a product you should consider for your first Alexa-enabled device.